Another year, another Chicago winter. After 20 inches of snow on Sunday, and a predicted negative eight degrees tonight, March couldn’t seem further away. For those with carports (worse yet—no garage), tomorrow morning will be filled with grumbling as drivers struggle to start their cars. Of course, the carport made for a great cost saving, quickly constructed option in the spring, but the years of blowing snow and subzero temperatures have made the idea of little more than a roof on stilts look worse and worse as time passed. Will this be the year that you protect your vehicle from the elements? How about the year that you can safely store decorations, bicycles, or tools without worrying that the items will be stolen? Value: According to Remodeling Magazine’s Cost vs. Value Report, a new garage adds over 60% of its purchase price as value to your home’s sale price. Storage: Garages are ideal for storage because they are completely enclosed and can be locked. They also tend to be larger than carports, with extra space for shelves or workbenches. Home Beauty: Homeowners with garages are more satisfied with the look of their garage. Protection from More than Rain and Snow: A carport can protect you from snow… Until 40-50 MPH gusts blow it onto your car. Garages are Available heated (and cooled), which makes life much easier when you are trying to cold-start a car. Safety: Each year, $1.26 billion in personal items and accessories are stolen from vehicles in about 1.85 million thefts (Nationwide). 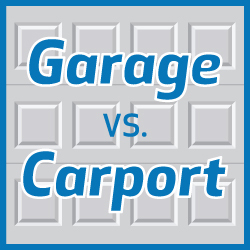 A garage can help keep your car safe and secure from damage and theft. Multiple Purposes: Think of it, an office, a man cave, a bar, or anything you’d like. Blue Sky Builders, your trusted source for custom garages throughout Chicagoland, is taking appointments for the impending warm weather. Contact us today to see how we can help you this spring.